How to easily screen adenosine A2AR agonists and antagonists? Many cells in the tumor microenvironment (TME) express CD39 and CD73, leading to the buildup of extracellular adenosine. Binding of adenosine with the high affinity A2a Receptor (A2aR) on the surface of T cells, macrophages, NK cells, neutrophils, and dendritic cells causes down-regulation of the immune response. Therefore, A2aR is now considered as a novel immune checkpoint protein leading to the hypothesis that a blockade of A2aR could effectively be a potential immunotherapy. 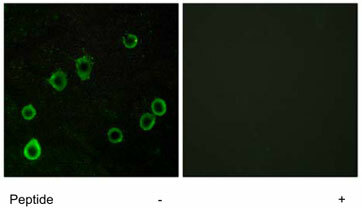 IF analysis of Dukes’ type C, grade IV, colorectal adenocarcinoma LoVo cells, using ADORA2A / A2AR polyclonal antibody (cat. nr PAB18061 – Abnova/tebu-bio). Peptide “+” means “with peptide blocking”. A2AR antagonists have progressed to clinical trials for the treatment of Parkinson’s disease. Pre-clinical studies have confirmed that blockade of A2AR activation has the ability to markedly enhance anti-tumor immunity. Mice treated with A2AR antagonists, such as ZM241385 or caffeine, show significantly delayed tumor growth. In parallel, A2AR knockout mice demonstrate increased tumor rejection. Most promisingly, A2AR blockade can be used in synergy with the inhibition of other immune checkpoint pathways. Studies show that the combination of A2AR blockade and PD-1 inhibition is more effective than either treatment separately. Also, A2AR blockade increases the activity of CTLA-4 and TIM-3 inhibition in controlling the growth of CD73+ melanoma. 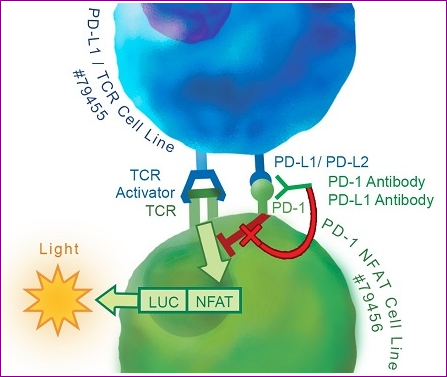 Considering the impressive results of CTLA-4 and PD-1 inhibition in cancer patients, investigation of A2AR blockade in the context of other checkpoint pathways may also have valuable applications for cancer therapy. The impact of A2AR on inflammatory responses lead researchers to investigate the possible use of A2AR agonists as potential treatments for disorders where excessive inflammation damages tissues (ex. sepsis, inflammatory bowel disease, rheumatoid arthritis…). A2AR could moderate tissue destruction and thus prolong survival in the setting of T-cell mediated inflammation. 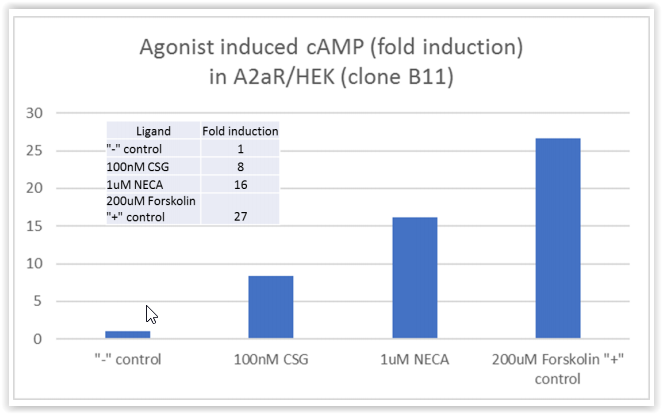 Agonist induced cAMP (fold induction) in A2aR/HEK293 cells A2aR/HEK293 cells were stimulated by various adenosine receptor agonists. The results are shown as fold induction of cAMP. In this context, BPS has released a fully validated and characterized Adenosine A2A Receptor Functional Recombinant Cell Line (cat. nr 79381 – HEK293 cells) containing a cAMP-responsive luciferase construct. The level of cAMP correlates with the respective adenosine (agonist) level, so the cell line can be used to measure the EC50 and IC50 values of A2AR agonists or antagonists in a quantitative manner. Binding of extracellular adenosine ligand or its stable analog NECA (5-(N-Ethylcarboxamido) adenosine) to A2AR expressed on the surface of this cell line can also produce a luciferase reporter signal for qualitative measurement, making the cell line doubly useful for analyzing A2AR activity. Leone R.D. et al. “A2aR antagonists: Next generation checkpoint blockade for cancer immunotherapy” (2015) Comp. Struct. Biotech. J. 13:265-272. Thank you to Suzan Oberle (BPS Bioscience) for helping us in editing this post. Interested in more information about these highly innovative kits? Don’t hesitate to contact me through the form below for further information.